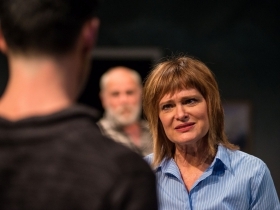 Comic drama “The Secret Mask” is uneven, but well-directed actors give it power. James Pickering and Tami Workentin in “The Secret Mask.” Photo by Ross Zentner. 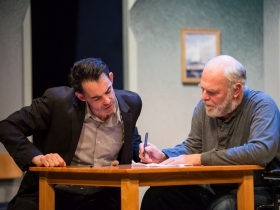 The title The Secret Mask refers to the unlikely resolution of an initially thoughtful drama of an estranged father and son, running through Dec. 10 at Next Act Theatre. 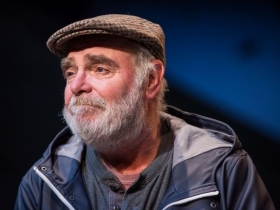 The first act is terrifically engaging as George in his forties, boiling with frustration about his own family life, comes with great reluctance to visit the father who walked out on him 42 years ago with nary a word. Now Ernie has had a stroke and struggles with aphasia, unable to recognize people or accurately identify common objects. All his words are muddled yet weirdly and humorously decipherable as George is reluctantly dragged into the net of caring for him. Prime dragger is Mae, the speech therapist, one of several parts played by Tami Workentin. 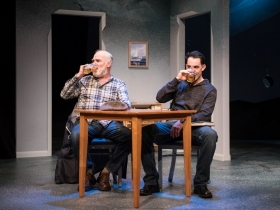 Playwright Rick Chafe has a genuinely touching situation here about patterns and mysterious bonds between father and son, though he ends on gimmickry rather than convincingly drawing together the strands of the plot and character development. 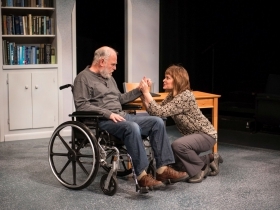 But he creates big laughs and eccentric revelations in Ernie’s rather glib aphasia, including movie references that may or may not be related to his actual life. For the actors, these malapropisms provide great moments for reaction before they grow wearying. It is about this point that the plot turns melodramatic and soap opera-ish to drive us toward a walk-into-the-sunset conclusion. What keeps us going are three accomplished actors of such experience that they may not have needed director Edward Morgan. But they surely must have been delighted to have Morgan’s interpretative guidance in continuity of character moods and changes. The acting requires considerable deftness benefiting from the director’s gentle polish and outside eye. The settings also require a free range of changing locales and entrances and exits, done with a few chairs, tables and some well-placed props. James Pickering as Ernie expertly balances the internal confusion with his slowly returning brain power. His character moves from truly lost to half lost master at sowing confusion. Pickering’s skills carry us through shifts in mood that in lesser hands would look stilted – and finally do toward the end. As George, Drew Parker keeps pace, an ideal stage partner. But he also provides emotional satisfaction in a series of phone calls that drive his portion of the plot and relate back to his changing moods about Ernie. Parker’s believability helps the phone calls emerge as one of the best parts of Chafe’s writing. 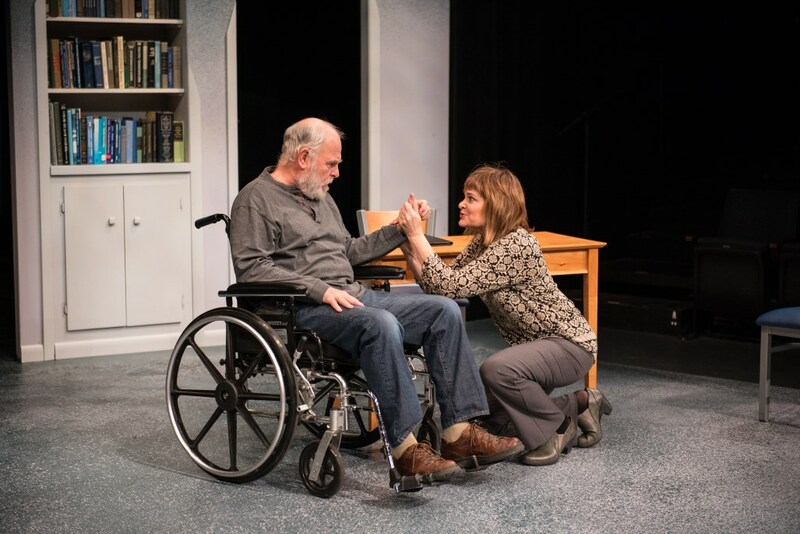 Mae is meant to be a professionally warm therapist, and Workentin provides that in a command of naturalism and quiet wit that survives the playwright getting the character too involved. She also makes the switches into other characters – a nursing home greeter, a waitress, a bank teller — almost like echoes of Mae even in their differences from each other. 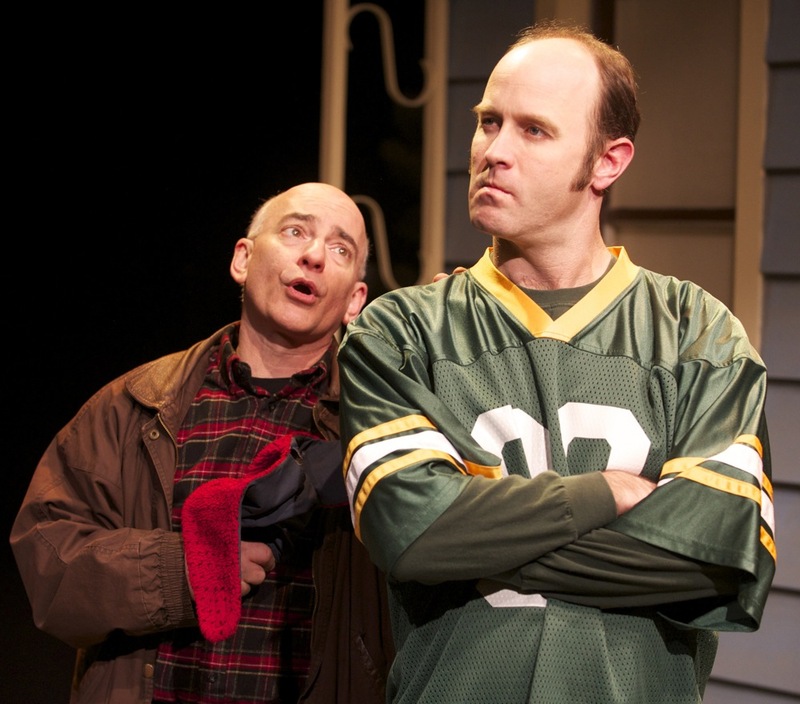 As with the other two actors, the technique is beneath the dialogue, in the little looks they dart to keep lifelike the exchanges and interrupted talk. The play had an arresting idea carried forward well for its first hour. But it is not the teasing meaning behind The Secret Mask title that is worth remembering. It is three actors at the top of their form.